As with many folks, I became entranced with Downton Abbey. I savored each episode, avoided social commitments on Sunday nights so I wouldn’t miss a thing, and then even bought the DVDs as well–to enjoy during the loooong wait until the next season began. Several years ago, during a trip to England, one of the high points of the trip was touring Highclere Castle, where most of the “upstairs” scenes in Downton were filmed. Anyone else here who was caught up on the series, too? 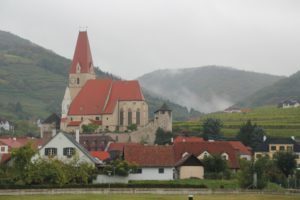 Viking River Cruises was one of the public television sponsors here in the USA, and by the time the entire Downton Abbey series was completed, I was not only hooked on the characters and storylines but also interested in those river cruises! And wonder of wonders, my dear hubby agreed. So, off we went to Budapest on October 7th and the start of a leisurely fourteen-day river cruise through Hungary, Austria, Germany and Holland. We just got back this past weekend, and I thought I would share a few photos. Thank goodness for digital camera these days–I took 2,874 pictures, and now need to wade through them all! The first photo is of the Chain Bridge in Budapest. I guess I should have known beforehand, but I was in awe at how many beautiful churches, cathedrals, and castles there are to savor along the route we chose. 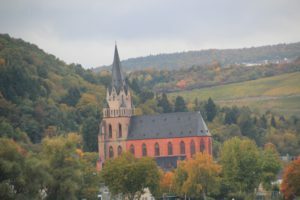 I don’t know the name of the churches in these photos, but seeing each one was like finding a jewel along the Danube, Main and Rhine rivers. 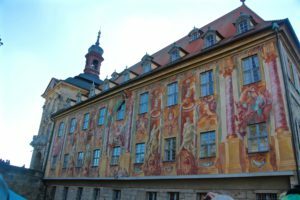 I so wish I could share photos with you of the interior of Melk Abbey and the Wurzburg Bishop’s Residenz, which were absolutely stunning. Photos were not allowed :( and I can’t legally copy photos from the souvenir booklets I bought. But–I highly recommend going to Google and searching “Wurzburg residenz interior images” and also “Melk Abbey images”, because they are simply breathtaking. Keep scrolling through the photos–there are lots of each place. I was dazzled! The fourth photo here is one of the countless stained glass windows we saw along the way. My photos looked sharp and clear on my computer, but they don’t look as sharp here on the blog for some reason. Seeing the beautiful scenery and the quaint, Medieval towns along the river system through these countries was awe-inspiring, but beyond that, the entire staff on the crew of the Viking longship was wonderful and the other guests on the boat were awesome. With just ninety-five rooms for guests, it was a relatively small group, compared to the big cruise ships with masses of people onboard, and we got to know a number of other guests quite well. Such fun! Now…you may wonder how this can relate to inspy writing. :) But it does. It was wonderful research! With every passing day I was brainstorming with myself about setting a new novella in just such a place. My husband thinks “Murder on the Viking” is a catchy title, but I want this to inspy romance, not suspense. So…do you think this sort of setting would work? If you happen to think of any good ideas for the plot and characters, I would love to hear about them! And on another note, what has been your own favorite trip? Is there someplace special that you would love to visit someday? 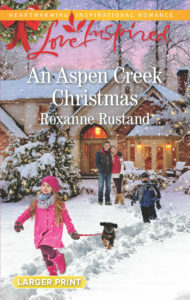 I’ll be drawing a name from the those who leave a comment, and the winner can choose any ebook title from my back list, which can be seen under the “Books” tab at www.roxannerustand.com. I’m probably one of the only people on the planet who hasn’t seen Downton Abbey. I know, I know, I’m missing out. Thanks for sharing your beautiful photos, Roxanne. One place I’d love to visit is Australia. I love your LI cover! Thanks for sharing your travels, Roxane. Even though I have never taken a Viking River Cruise, I have traveled along the Danube and Main, and on the Rhine River twice. I was born in Germany and am a retired German teacher and have been to Europe five times. Europe is steeped in history and I enjoy the architecture of the cathedrals and castles. Hope you will share more about your travels and more pictures. I enjoyed reading your Christmas novella A London Christmas in the Sweet Christmas Kisses 3 boxed set. Even though I thought Catriona was by traveling to London after meeting a guy on line, I had some students do the same. The premise of the romance was on target. Americans are often too trusting. I definitely was immediately drawn in and as a mother wanted to give her some traveling advice. I know you did your research about how to replace a passport. Your covers are adorable – love the one above, which is similar to your Winter Reunion. I would also love to read A Loner’s Thanksgiving Wish, which is fitting at this time of year. My sister-in-law loves Scotties and so I was drawn to her book A Scottish Christmas. Enjoy the memories of your European adventure, especially as you sort through your pictures. Best wishes and Happy Writing. Your trip sounds like it was wonderful. The pictures are great. I’m sure it would be an interesting setting to read about. The book cover looks like fun! Love these photos! Thanks for sharing! It sounds like it would be a great setting to read about, although I’ve never watched Downton Abbey. My favorite trip was when my mom, step-dad, my sister and I drove out west. 6,000 miles in 12 days. So many things to see in so little time. But it was so much fun! My husband and I loved Downton Abbey as well! Just returned from a trip to Disneyland and referred to Downtown Disney as ‘Downton Disney’. 😊 A few years ago we hiked the beautiful Scottish Highlands – walking 50 miles on the west highland trail. We went with a renowned author and 6 other ladies all ages and different walking speeds. We had many adventures and divine appointments! The author wrote a book mentioning some of the ‘wonderstruck’ moments along the way. We hope to go to Italy 🇮🇹 before our 50th wedding anniversary in 2019. I have never seen Downtown Abbey but heard it was good. Thanks for sharing your experience and beautiful pictures. What a fantastic experience! Thanks for posting the pics. Thanks for sharing your photos. I would love to go to England, and Scotland one day. I would love to see all of Europe, but if I had to pick a starting place that is where I would go. I have not seen Downtown Abbey but I am jealous of your trip, vacations aren’t something we get to do since we never have the money even if we try to save something comes up and the money is gone. I would love to go so many places, Italy, Ireland, Scotland, England, France, Australia. But realistically as I hate flying and don’t do boats I would like to do a road trip around the US and I definitely want to go to New Orleans. I love your pictures. It sounds like you had a wonderful time. I loved my trip to England and Scotland. We also popped over to Stockholm, Sweden for a couple of days while we were there. Another favorite trip was to Switzerland, where my maternal grandparents are from. We were able to visit the house where my grandfather grew up–right in the middle of the Alps near Interlaken. 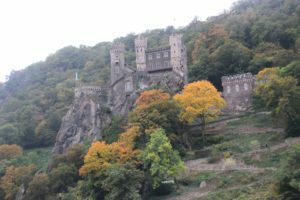 We also toured southern Germany, Austria, and spent a day in France. And yes, it’s amazing how many cathedrals, castles, and churches they can cram into European countries! But they are so interesting and beautiful. I loved your pics. It reminds me of a family trip we did in 2010 to the United Kingdom. Northern England and Scotland were my favorites, and my guess is that it is much related to the old architecture of Churches and castles. I’d love to read inspirational romance in those places. I’m not very creative for plots, I’ll leave that to you, but can definitely say I’d love to read about it. The Danube, Main and Rhine rivers are in my list of to go places (though I’ve seen a bit of the Rhine in Basel when visiting for a grad school interview). It’s one of my favorite places I’ve visited so far. I’ve been looking forward to go back with my husband ever since. For sure a book over there would be another must read. Other places in our to visit list are countries coasting the North Sea (from France, Belgium, and Netherlands, to Denmark and the Scandinavian Peninsula). Roxanne, we did the Passau to Budapest portion of your cruise two years ago. I loved the Danube and did see Melk Abbey. I’m one of those who also didn’t get caught up in the Downton Abbey series. I had missed the first two seasons and didn’t want to start in the middle. When we were on our cruise this summer, I discovered they had all the seasons of Downton Abbey on the TV on the cruise ship. I wish I had realized that the first day at sea. I started watching on our last day at sea and only got through 1 1/2 seasons. We just got Amazon prime so sometime, who knows when, I will try to watch the rest. It’s very hard to tell my favorite trip, as the Lord has given us lots of opportunities for lots of trips. Right now we’re just finishing a week in the Washington, DC, area. We got to spend 2 days in Williamsburg, VA – all the history was so interesting, and they do living history very well in Williamsburg! We also visited a nephew in Dover, Delaware, and got to do a walking tour in the old section of Dover – more interesting history! A river cruise sounds like a fascinating experience! Thanks for sharing some pictures! All we’ve ever taken is road trips but I’d love to take a trip by train or ship some day as well! We recently went to San Francisco and visited a Catholic Church there, I think it was called St. Mary’s Cathedral and it looked just as magnificent at that church picture you have posted here! I only took a couple of pictures of the front because I wasn’t sure if they were allowed or not, there wasn’t a sign saying anything. It was so reverent inside, like stepping into a holy place (though I’m not Catholic) and I didn’t want to talk above a whisper! 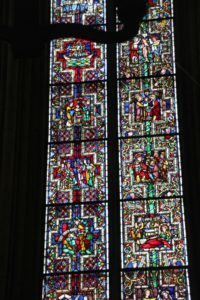 The stained glass windows were breath-taking and depicted various bible scenes. I think one was when John was baptizing in the river. 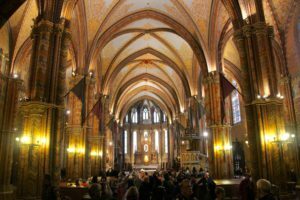 Though I’ve seen pictures of churches like this, I just never been in one and it was a totally different feeling….I was in awe of everything inside! Thanks for sharing your trip with us and the beautiful pictures. I’m sure there’s a story in those castles!